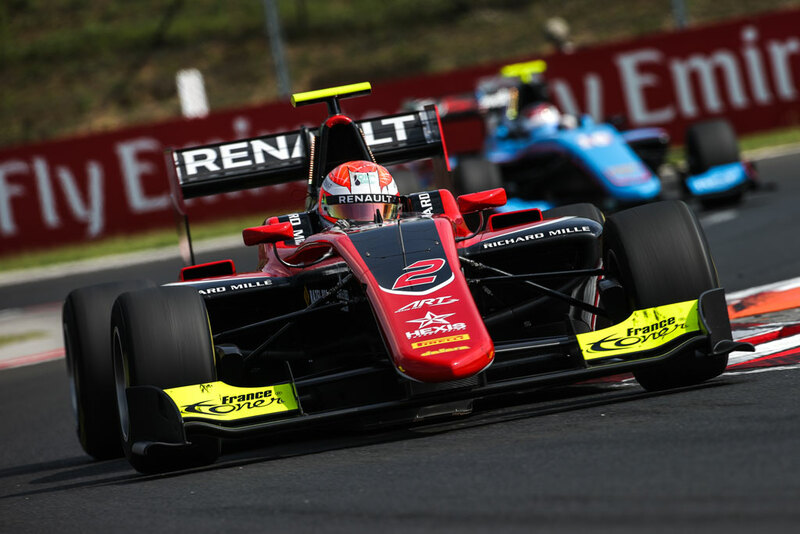 After Silverstone, Anthoine won a second consecutive pole position in Hungary, theater of the 5th set of the GP3 championship. Under the hot sun of Hungaroring, Anthoine hoped to realise again his achievement of Silverstone where he has been the leader from the start to the end of the race, but fate decided otherwise. Heavy rains had washed the starting grid which has lost its adherence, so the French pilot slipped excessively. Then, the race direction deactivated the DRS for technical reasons. Finally, the hotness corroded slowly but surely the Pirelli gums. « Stars were clearly not aligned for me in the first race », Anthoine said. « Starting from the pole position, I only had one goal, victory. I had no excuses, I lost the profit of my pole position since the beginning which his traditionally one of my strong points. Once the 3rd, any chance left between the tyres degradation and the prohibition of using the DRS ». Despite his slight disappointment not having transformed his pole position in victory, Anthoine realised a good financial operation at the championship increasing his advance – from 6 to 15 points – on his fiercer opponent, his teammate Callum Ilott. Anthoine proved his mental strength expunging the affront of the first set by a lightning start in the second Hungarian session. From the 6th place on the grid, he reached the 3rd rank in the wheels of Boccolacci and Ilott. Anthoine won his 6th podium in 10 races which let him keep Ilott at the respectable distance of 15 points at the championship. « After an excellent start, I consolidated my place of 3rd driver and I tried to fill the gap between Ilott and I. But I didn’t want to try something stupid ; I thought about the championship, it’s the beginning of its second part and to be constant in the outpost is crucial. I was on advance on my plan and I was happy to go on holiday with this idea in mind ! » Anthoine concluded. The GP3 will continue his 2018 edition on the weekend of 24-26 August, in Spa-Francorchamps.